The Hirshhorn Museum and Sculpture Garden has announced the acquisition of contemporary Chinese artist, Ai Weiwei’s monumental “Trace” (2014), an expansive installation spanning over 1,200 feet and portraying individuals from around the world whom the artist and various human rights groups consider to be activists, prisoners of conscience and advocates of free speech. The museum has continued to be a major proponent of Ai Weiwei’s groundbreaking work after hosting the artist’s first United States retrospective in 2013. 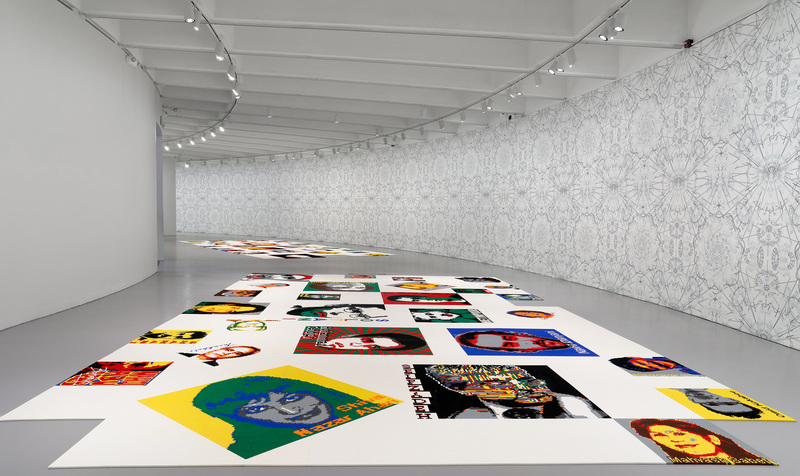 The installation comprises 176 portraits made of more than 1.2 million plastic LEGO® bricks, assembled by hand and laid out on the floor. Each portrait is pixelated, resembling surveillance or photos found on the internet. The graphic manipulation can symbolize the dissolving nature of the individual or may suggest that each person has been encoded as a form of digital data. Additionally, the colors in each portrait roughly represent the colors of the subject’s national flags. The work foregrounds Ai Weiwei’s own experiences of incarceration, interrogation and surveillance. In 2011, he was detained by the Chinese government for eighty-one days and then prohibited from traveling abroad until 2015. Like Ai Weiwei, the individuals represented in “Trace” have been detained, exiled, or have sought political asylum because of their actions, beliefs or affiliations. Commissioned in 2014, “Trace” first opened as part of @Large: Ai Weiwei on Alcatraz, a site-specific takeover of the former Alcatraz Federal Penitentiary in San Francisco, and a collaboration between the nonprofit FOR-SITE Foundation, the National Park Service, and the Golden Gate Park Conservancy. “Trace” enters into the collection joining one previously acquired work by Ai Weiwei titled “Cube Light” which was acquired in 2012. Ai Weiwei’s work, as prolific as it is eclectic, encompasses a wide range of media, including sculpture, installation, photography, film, painting and architecture. The artist has sought to incite change through his art since the late 1970s, and as his work has developed, he has become increasingly committed to his guiding principle of promoting human rights and freedom of expression for all. In this new context, “Trace” offers a unique opportunity for viewers to engage directly with contemporary issues that remain in the world today. The Hirshhorn Museum and Sculpture Garden is the national museum of modern and contemporary art and a leading voice for 21st-century art and culture. Part of the Smithsonian, the Hirshhorn is located prominently on the National Mall in Washington, D.C. With nearly 12,000 paintings, sculptures, photographs, mixed-media installations, works on paper and new media works, its holdings encompass one of the most important collections of postwar American and European art in the world. The Hirshhorn presents diverse exhibitions and offers an array of public programs on the art of our time—free to all, 364 days a year. For more information, visit hirshhorn.si.edu. Image: Ai Weiwei, installation view of Ai Weiwei: Trace at Hirshhorn at the Hirshhorn Museum and Sculpture Garden, 2017. Photo: Cathy Carver.